There are two main games offered on FreeBitcoin: Multiply BTC and Lottery. There are actually three games here, the third one being the Free Play or Free BTC game, but for this Freebitco.in review, we think it would be more appropriate to consider the Free Play as the bitcoin faucet since playing it does not really have the feel of playing an actual bitcoin betting game. It’s more like taking your chance to get free bitcoins that you can use later on in the major games. The idea here is that you can play the hourly Free BTC to win up to 200 USD worth of bitcoins so you can have bitcoins to use in the two main games. Multiply BTC is referred to as a provably fair Hi-Lo game. It is a game wherein you “Bet Hi” or “Bet Lo.” This game offers a high maximum profit of up to 40 BTC. Despite the “hi-lo game” description, the mechanics of this game are actually comparable to the dice game Rollin.io except that you can’t directly determine the number(s) that will serve as the basis if your bet wins or loses. The basis number is a set of two numbers that change depending on the payout amount you set. By default, the payout is set at 2.00, which means that you will win if you Bet Hi and the result is higher than 5250 or you Bet Lo and the result is lower than 4750. You can change the payout value to any number between 1.01 and 4750. If you set the payout to the maximum of 4750, you will only win if you Bet Hi and the result is higher than 9998 or you Bet Lo and the result is lower than 2. There’s nothing complicated in this game. If you have had experience in other online casino games, it should be easy figuring out how this game works. You just have to enter two numbers: your Bet Amount and the Payout or Win Chance. Once you enter these two numbers, the Win Profit, the game basis numbers, and the Payout/Win Chance (depending on which one you decided to set) are automatically adjusted. The Lottery game on Freebitco.in is a weekly lottery draw with relatively big prizes. The prizes are indicated on the site. There are 10 prizes to be won. You may notice that the prizes here keep changing. The reason for this is that the prizes are continuously adjusted to reflect the fluctuating exchange rate between bitcoins and the US dollars. The biggest prize is fixed at 200 USD so the prizes need to be adjusted to reflect the equivalent bitcoin value. Each ticket in the lottery game costs 0.00000013 BTC. You also automatically get 2 lottery tickets for every Free BTC roll you play. FreeBitco appears to be using its own proprietary software. The Free BTC Game and Multiply BTC game (hi-lo) are provably fair. To get the server hash, client seed, and nonce for the next roll, you just have to click on the Provably Fair links on the games. They are conspicuous enough so you shouldn’t have difficulties finding them. There’s a link to a verification tool (external) presented along with the server hash, client seed, and nonce. The Lottery game on Freebitco.in is not provably fair. Freebitcoin has a mobile-friendly version of its website. Like a typical bitcoin mobile casino, the site automatically adapts to the size of the screen of the device used to access it. The signup page is the focus of the homepage of the mobile version, suggesting that you really need to sign up to be able to play. Freebitcoin does not have a dedicated mobile app for playing the games on smartphones and tablets. However, we have to say in this Freebitco.in review that the mobile-friendly site is enough to provide a good mobile gaming experience. Freebitco.in only uses bitcoins but the prizes mentioned on the site are stated in either USD ($) or BTC. Making deposits on this site is similar to how it is done with most other bitcoin betting sites. Deposits are from wallet to wallet. The Deposit/Withdrawal interface is under the Profile page. Deposits are credited after 1 confirmation. With the deposits, FreeBitco has a slightly different setup, albeit still under a wallet-to-wallet scheme. You can withdraw manually, you can have Auto Withdraw enabled, or you can use the Instant Withdraw option. Manual withdrawals usually take around 6 hours to be completed. There is a minimum withdrawal limit of 0.00010400 BTC. A fee of 0.00000400 BTC will then be charged as a deduction from the amount you withdraw. The Auto Withdraw feature sends your account balance automatically to your bitcoin wallet on Sundays. You will receive an email regarding the automatic withdrawal every time a transfer has been successfully completed. With Auto Withdraw, you may have to wait longer before you can get your bitcoins but you can enjoy the advantage of not having to pay for the transaction fee. FreBitcoin shoulders the transaction fee when you choose Auto Withdraw. Intant Withdraw, on the other hand, has a slightly higher minimum withdrawal limit (compared to manual) at 0.00041000 BTC. However, you can get your bitcoins faster since the transaction is supposed to take only 15 minutes. If you choose this withdrawal option, you will also have to pay a higher transaction fee of 0.00031000 BTC. Freebitco.in, unfortunately, does not offer bonuses and promotions. It does not have a sign up bonus, first deposit bonus, or a reload bonus offer. What it offers in lieu of these bonuses is a free bitcoin faucet in the guise of a Free BTC game. The bitcoin faucet can be accessed by going to the that Free BTC game page. It is a button under the Free BTC payout table or should we say it is actually what the Free BTC game is all about. 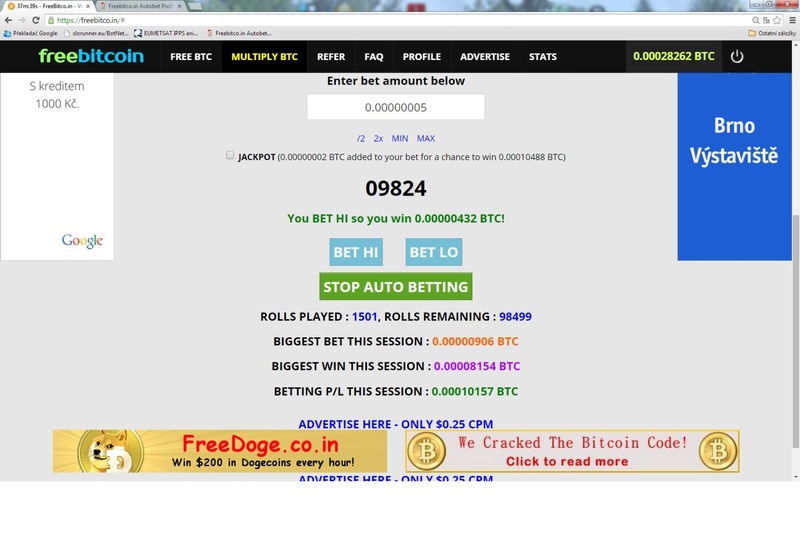 The Free BTC game allows you to win real bitcoins that can be used to play in the Multiply BTC and Lottery games. This game offers from 0.00000246 BTC to 0.334485137 BTC (the amounts stated at the time we were doing this Freebitco.in review). Every roll in this free game also grants 2 free tickets for the Lottery game. Also, Freebitco.in has a generous referral or affiliate program which offers a 50% commission on all of the free bitcoins won by the players you referred to the site. Yes, it sounds really “massive,” as the site puts it, but it actually isn’t that big. After all, the commission is only based on the Free BTC game, which does not really offer huge bitcoin prizes. IP filtering is apparently something not being done by Freebitco.in. There is also no list of restricted countries presented on the site. It can be accessed by players in the United States. As such, we are inclined to write in this FreeBitcoin review that this site is like a US-accepted bitcoin casino. It can also be considered a free bitcoin casino, obviously, because of its Free BTC game and bitcoin faucet. It took us some time before we found the way to contact FreeBitco for support, inquiries, or technical assistance. There is no contact button or email address on the site. What the site has is just an online contact form (via email) and it is located deep under the FAQ page. After clicking on the FAQ link, you still have to scroll below to see the “How can I contact you” question, which presents the contact form for the site. The FreeBitco website does not provide information about its license and regulation. Just like in other similar sites, we are not going to be too keen on this since others don’t also present their licensing details. In terms of account security, Freebitco.in offers the typical level of account and transaction protection afforded by most other bitcoin betting sites. We can say in this Freebitco.in review that the idea behind this site is really good. The website could use some major aesthetic improvements but the games are enticing enough. We particularly like how the site offers Freebitco.in through a free BTC game, albeit in very small amounts, to let players start playing and winning without having to make any deposit. If you are lucky enough, you can win bitcoins here without spending even a single satoshi.